Revlon by Marchesa Nail Art 3D Jewel Appliques - fools people into thinking you're a genius! 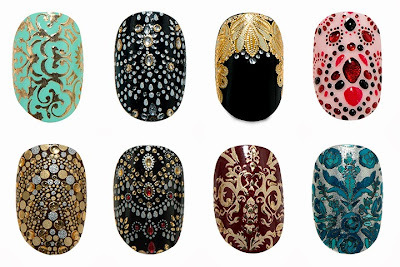 Revlon by Marchesa Nail Art 3D Jewel Applique - $8.95 - in 8 designs: 24H Brocade, Beaded Couture, Crown Jewels, Evening Garnet, Gilded Mosaic, Jeweled Noir, Royal Burgundy and Silk Rosette - each set contains 18 textured strips that will fit most nail sizes, are easy to apply and won't dry out or stain the nails. Available for a limited time at drug and mass retailers across Canada. No big shocker that I went right for the blue with 24K Brocade - the design was a little more conducive to my tiny little nails as well! I don't usually bother testing nail strips out myself but these were just so pretty that I couldn't resist and I actually managed to do a not too bad job of it! My tip for other ladies with little nails, use them upside down. There is a flatter, wider edge that is meant to go at the cuticle that tapers off to the tip part. The tip end is narrower so I used that end at my cuticle instead which was a better fit for me - that might not work for all of the designs but didn't matter for this one! I should have placed it a little closer to my cuticle on the middle finger but overall I was impressed at how easy it was and how well it turned out. I've gotten many compliments on them since I applied them with several people actually thinking that it was painted on nail art and not stickers - that's where the "genius" part comes in! I don't bother correcting them, I just look exhausted and say thank you! LOL "I just look exhausted and say thank you!" That's a good strategy! Out of all the nail wraps in this collection, this is the one I like the most as well! 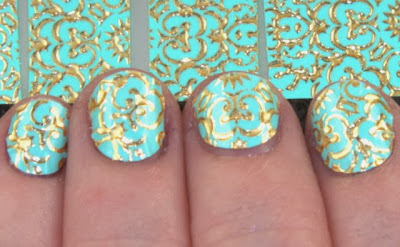 Nothing goes wrong with a Tiffany blue and some gold!